In Gotham City Killer Croc breaks into a Lex-Com facility and makes off with a strange glowing crystal despite the best efforts of the security staff. Later Batman listens in as Luthor discusses the break in with his people. Luthor is insistent that they get back his property from Croc at any costs. Meanwhile Croc meets with Schrocken, the creature that sent him to steal the crystal in the first place. The rather odorous Schrocken, even more inhuman than Croc, is pleased that the crystal wasn't damaged during the job but attacks Croc for daring to speak to him without Schrocken's approval. Fearing for his life Croc manages to break free, dives into the river and escapes. The next day in Metropolis Lois and Clark have lunch with an upbeat Pete Ross, who is feeling a lot better about his life than he had a few weeks before. As Pete compliments the two on the fact that despite their hectic lives they still manage to hold it together Clark gets called away. Minutes later he flies into the Batcave, where Batman has the security tape from the previous night's break-in. He tells Superman to check out one of the arms of the stolen item, which has Kryptonian writing on it. Batman believes them to be serial numbers, but none of them match, leading Batman to think that Luthor may have culled whatever was stolen from Kryptonian hardware he was been salvaging through the years. Superman asks him why Croc would be after it. Batman's theory is that because of his simple minded nature Croc wasn't behind the theft and that someone else was involved. On Gotham's West Side two well dressed gentlemen discuss the differences between their two cities. The taller of the two tells the other that the device will be transported that night. The smaller gentleman gives his partner a device that contains the programming once everything is set up. After telling his taller companion that they will change the world the smaller man leaves. A street punk follows the old man into an alley and seconds later a pink bolt of energy erupts from the darkness. Later on the north Atlantic a fishing vessel pulls Croc out of the ocean. After contacting the authorities the crew is warned not to mess with Croc's body. The ship's crew believes Croc to be dead but is soon proven wrong. Croc goes crazy and makes his way to the deck but Batman stops him from doing anymore damage. The two fight all over the ship and it's only a hallucination on Croc's part that allows Batman to get the upper hand and lock him inside the freezer. That night a state trooper on Interstate 5 pulls over a dingy vehicle. When the trooper approaches the vehicle the occupant attacks and kills him before continuing his trip to Metropolis. The next morning Clark Kent arrives at the Daily Planet and after chatting with Jimmy Olsen settles in at his desk. Suddenly an earthquake begins to rock the building and Clark quickly changes to Superman. The Man of Steel can't believe his eyes as green crystals erupt from the ground. Story - 4: It's interesting. Back in 1990 Marvel Comics launched a new Spider-Man book titled simply SPIDER-MAN as a showcase for Todd McFarlane, who at the time was THE artist for the character. I don't remember much of the story (because there wasn't much story to remember) but I do remember that the villain was the Lizard and the title of the first story arc was "Torment." 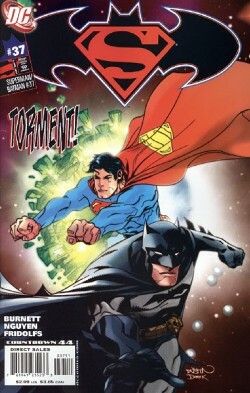 Now here it is seventeen years later and we have an issue of SUPERMAN/BATMAN written by animation veteran Alan Burnett with Killer Croc as one of the seemingly central figures and the title of the first chapter of the arc is "Torment." Please keep in mind that I am not accusing Mr. Burnett of stealing from Todd McFarlane. I just thought it was kind of interesting. Crocs. Lizards. Torment. It just appeals to my own peculiar nature to have things synch up like that. Beyond that this was an interesting first chapter. Burnett played this one really close to the vest and dealt with the plot and villains only in shadowy, mysterious terms. I can't say that I like the overall story just yet but only because I really need to see more of it before I make my mind up. I've learned from my past mistakes on this title of jumping in and loving the introductory chapter and then being somewhat disappointed because the rest of the story really didn't live up to all of the expectations that I set up in my head. There is potential for a good story here. Burnett brings Superman and Batman together organically. To me the best Superman/Batman stories are those where one of the two gets involved in a case that somehow ties to the other. While I like the friendship between the two I just can't see them just hanging out really and getting involved in a case on the fly. These are two busy men. They each have their own wars to fight so the thought of something happening while they are sitting around having a cup of coffee doesn't scan with me as well as the two needing each other on a case. I could be wrong about this, but I don't think I am. Of course I sometimes wonder if an ongoing with these two characters won't eventually lead to more bad stories than good, but apparently I am one of the only ones who feel this way. I would be remiss if I didn't ask exactly where this book fits into the overall continuity? Lex is in a suit, making me think this is before INFINITE CRISIS. Pete is there, though, and it seems from the dialogue that this is after everything that happened with his time in the White House. I could buy that they are setting stories outside of continuity but if they insist on adding little things like Pete then I am going to question it. Maybe I shouldn't. Maybe I should just sit back and enjoy the story. But I can't. I like continuity. I'm easier on it than I used to be, but still. And in looking at the cover for next issue anyone have a feeling that Scarecrow might be involved in all of this? Croc did have a hallucination. Art - 4: I can't say for sure that I liked the art in this issue. It wasn't bad. Nguyen and Fridolfs come together to produce some moody and interesting art and the creatures certainly look good. The people are kind of strange looking but I don't think they look bad; just different. Thus far the art fits the story, so for right now I have no issues. Cover Art - 3: Why does this book have two covers? I realize that the "official" answer was to give retailers an incentive to order more copies of a book that has had issues with lateness for well over a year. Sure things have gotten better, but in talking to the retailers in my area I get the feeling this book has been kind of a pain and the only good thing I have heard is that most of the issues were returnable. So maybe they were appealing to the more mercenary retailers by offering this as an enticement to order a few more copies so they can jack up the price on the variant that some poor Superman fan who is a completist will buy. And yes I am talking about myself here. I lucked out because the manager from the store that I have my hold box at is getting sick of all of the DC variant covers and has been selling them to me for cover price. I guess it doesn't help that both of these covers pretty much sucked. Claudio Castellini and Noemi Vicens Cover: SUPERMAN/BATMAN; now with 75% more slime. It is amazing to note that this cover contains just about every bit of artistic business that I absolutely hate when it comes to Superman and Batman. The black on the Superman symbol that doesn't involve KINGDOM COME. 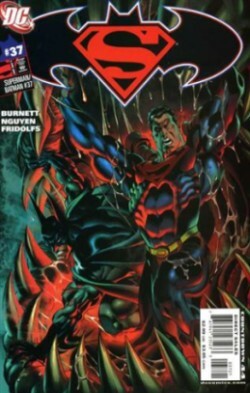 The "red-eyed" Superman, making him appear more like the Terminator than the Last Son of Krypton. Batman's extra long horns. I can't think of a single thing I like about this cover, so I'm going to move on. Dustin Nguyen, Derek Fridolfs and Rod Reis Cover: Slightly better that the other cover but not by much. There is something off about both characters and I can't quite put my finger on it. Like the interior art it's isn't all that bad, but it isn't all that good. Still, much more likable than the other one.